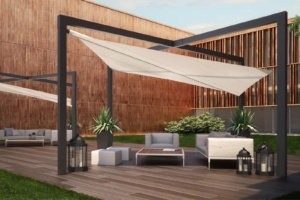 Our Sail shades are designed to create a visual impact enhancing the feel of the surrounding area. 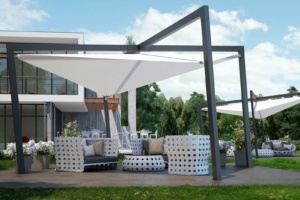 Extremely versatile and stylish our made to order sail shades are a perfect addition to hotels and restaurants where there is a much needed requirement to grab attention. They are also perfect for school and nurseries for the playgrounds and shopping centres. Though minimal in rain protection the sails provide a good UV protection and are available in a range of shapes and sizes. We can customise these to suit various requirements. We also work with other manufacturers and can provide solutions which do not have posts or just as required. For further information, or to book for a free site survey please call us on 07546 343499 or 07546 343411.